Specialising in an extensive range of property design, redesign and everything in between, Callender Howorth offers an unparalleled luxury design service in St Tropez. Our team of highly-trained professionals consistently exceeds the expectations of its clients in the most prestigious areas of Europe, such as Central London and the French Riviera. Our talented luxury interior designers in St Tropez do not compromise on quality; all aspects of a scheme are considered to find the perfect bespoke solution for our clients. 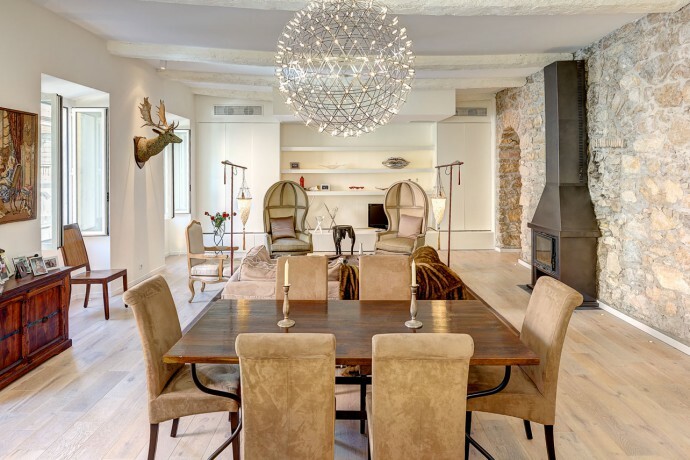 We invite you to browse our portfolio of completed projects and contact us if you would like to discuss your interior design project in St Tropez. Callender Howorth has undertaken a number of exclusive interior design projects on the French Riviera. We worked on an amazing project in Nice when we transformed an apartment building that hadn’t been renovated in 50 years into a stylish and contemporary new home. The whole property was completely gutted back to its original stone wall with five rooms being removed to create one large living space. The stone wall was sand blasted back to its honey toned state to become a unique but authentic backdrop. 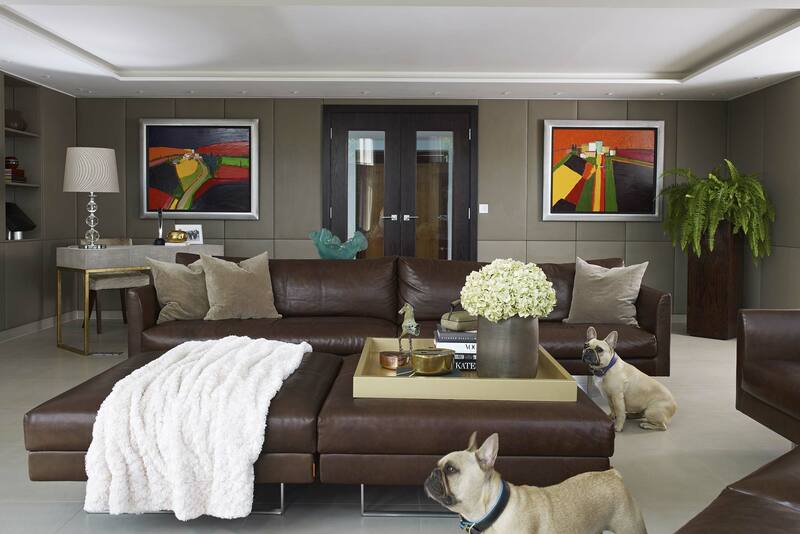 The stunning interior architecture was completed by adding custom-fitted lighting and bespoke furniture and art. The apartment is light, airy and contemporary in the style of modern Riviera interior architecture and our luxury interior designers in St Tropez can do the same for your home. Until the American jet set arrived in the fifties and sixties, St Tropez was a fishing village. It still retains this charm in its old town and its narrow streets are packed with characteristic fishermen houses that have been renovated into more modern incarnations by St Tropez luxury interior designers. Pastel and ochre coloured houses with narrow fronts line the beautiful waterfront and the houses that used to have boat shelters are now shops. The surrounding villages of Ramatuelle and Gassin are full of traditional stone houses and bastides combined with ultra-modern villas and beach houses. Chateau de la Moutte is a listed building and a striking example of St Tropez’s architectural heritage. Bought in 1860 by Emile Ollivier, Napoleon III’s Prime Minister, today it is run by the city who hold concerts there every summer. What Cultural attractions does St Tropez offer? Socialites and sun-worshippers head to Pampelonne Beach for its party atmosphere and enviable clear waters. The 3-mile stretch was immortalised by Brigitte Bardot in the 1950s and now it is packed with upmarket beach clubs like Club 55 and Nikki Beach. However, St Tropez is as famous for its vineyards as for its beaches since high-quality rosé wines are the region’s signature drink. The Domaine Bertaud Belieu Vineyard in Gassin dates back to the fourteenth century but has recently been made famous by Leonardo Di Caprio’s annual gala. The historic centre of St Tropez is crowned by the 16th-century Citadel. It is situated on a green and wooded hill and offers panoramic views out to sea. Inside the castle, you can visit a museum of the town’s maritime history. Locals congregate at Place des Lices, St Tropez’s large central square. Elderly residents play boules under the plane trees and a traditional Provençal market is held twice a week, adding yet more colour to the charming square. There is much inspiration to be gained from watching local life for luxury St Tropez interior designers. St Tropez is bursting with nightlife and dining options. The Auberge de Maures is the oldest restaurant in town and has attracted the likes of Picasso, Charlie Chaplin and David Niven. The 80-year-old establishment is a must visit and is a fascinating look back into St Tropez most glamorous days. Résidence de la Pinède on the Plage de la Bouillabaisse offers an ultra-exclusive dining experience, giving the 3-Michelin star chef Arnaud Donckele a platform to showcase his culinary skills to an upmarket clientele. After spending the day at Tahiti Beach or partying at a Pampelonne beach club, well-heeled Tropeziennes head to chic night club Caves du Roy at Hotel Byblos. Why would you want to live in St Tropez? Which famous residents live there? The mild climate and Mediterranean lifestyle make St Tropez an appealing place for all personalities. St Tropez is well placed for families since there are a number of good schools in the area, including a few international schools like Mougins School. The school has a custom-built campus and follows a British curriculum for ages 3 to 18. The International School of Nice educates children aged 4-18 years and has a good reputation. Luxury interior designers in St Tropez have worked on many famous residents’ villas and mansions. Brigitte Bardot, Joan Collins and Michael Douglas are a few residents that have bought or rented homes in St Tropez. Our interior designers are on hand to assist with your St Tropez interior design project. Contact our team today. Complete design, build and project management service in St Tropez.